Host your next group event here and send your guests on an adventure! OdySea Mirror Maze is the perfect fun and unique place to hold your next field trip, family get together, company meeting or group outing. What better way to celebrate a loved ones achievements or bring a team closer together than exploring the mysteries of the mayan rainforest or escaping lasers in our laser vault. Our after hour events are perfect for team building, family celebrations or private social events. 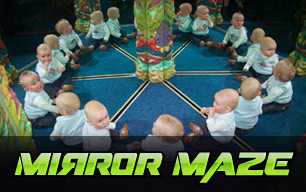 In teams of 3-5, blind folded team members must be lead through the mirror maze by the remaining team members. Each team member must put their hands on the shoulders of the team member in front of them, the lead team member and the team member on the end are blind folded. 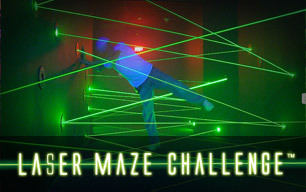 In teams of 3-5, team members are joined by a rope and must weave their way through the laser challenge. Touching a laser will add 30 points to your score and you only have 3 minutes to complete the challenge.